Product Number: 30-90352 M.S.R.P. $ 54.95 First appeared in: 2010 RTR Catalog M.T.H. Electric Trains offers a variety of RailTownT buildings to help you create whatever kind of atmosphere you desire; rural or urban, nostalgic or modern. Operating buildings transfer your layout's action from trains to structures adding fun and excitement to the entire pike. 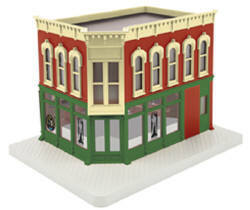 RailTown buildings are a perfect addition on any O Gauge layout, as each is sized for use with all O Gauge locomotives and rolling stock regardless of manufacturer. •Unit Measures:9 7/8" x 7 7/16" x 7 1/16"